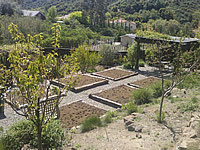 A few thoughts on garden design. We cultivate a sense of security through the garden itself, by building a proportionately scaled framework. All elements tie together to create interest, sanctuary, vivacity, and relationship to nature. 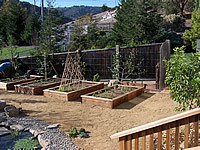 The first image shows large raised planters using unpeeled redwood logs to line and elevate the gravel area. The area is large enough to get a small tiller into. The second image show raised planters made from redwood milled lumber. Posts are on the inside to save room and prevent bumping your shins into. The topcap acts as a seat to allow a more comfortable gardening experience. The irrigation is an efficient drip grip so the leaves of vegetables don't get sprayed with water which can cause mildew. 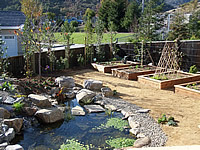 The adjacent pond adds a relaxing element, and the water can be used for the garden since it is free of chlorine, and is full of fish nutrients. 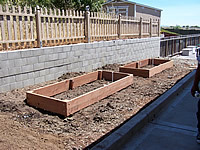 The third image has raised planters built by high schoolers for their edible gardening program. These sit right outside the classroom so students get to see the progress of the garden. 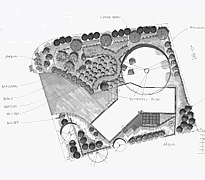 This is vital because many gardens will get forgotten if set in the back corner of a property.